A fun camp for kids ages 5-7. Participants will be involved in all aspect of the ballet - from learning the ballet choreography, watching excerpts of the ballet and creating the backdrops of the ballet for the finale performance on the stage for families and friends on the last day of the camp. From August 20th to 25th, 2018, 9:00 am to 12:00 pm. Final Demonstration will be inside the studio and Performance on stage August 25th 11:00 am-11:30am. Please select payment form: Cash/Cheque at the school during office hours E-transfer to admin@mapleleafballet.ca / contact the school about password Credit Card - an online invoice will be sent to the email on the registration. 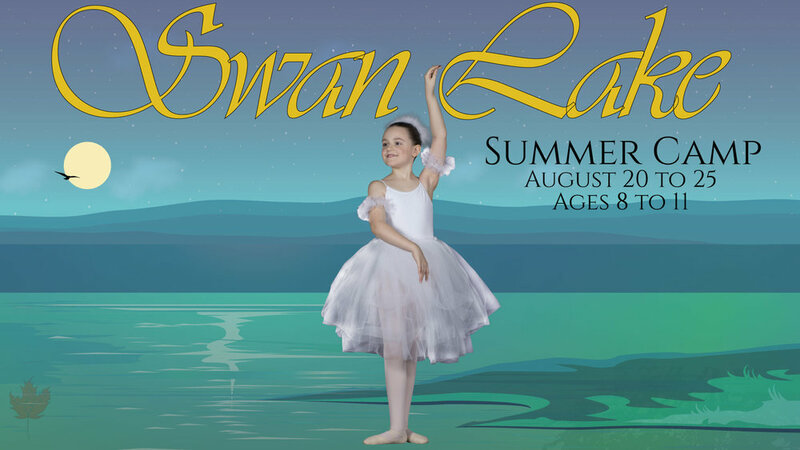 A program for boys and girls based on the iconic ballet, Swan Lake. Participants will learn choreography based on the ballet, learn the basic technique of Russian Ballet, watch excerpts of the ballet, and give a performance on stage for their families and friends on the last day. From August 20th to 25th, 2018, 12:30 pm-4:00 pm. Final Demonstration inside the studio and Performance on stage August 25th 12:30 pm -1:00 pm.